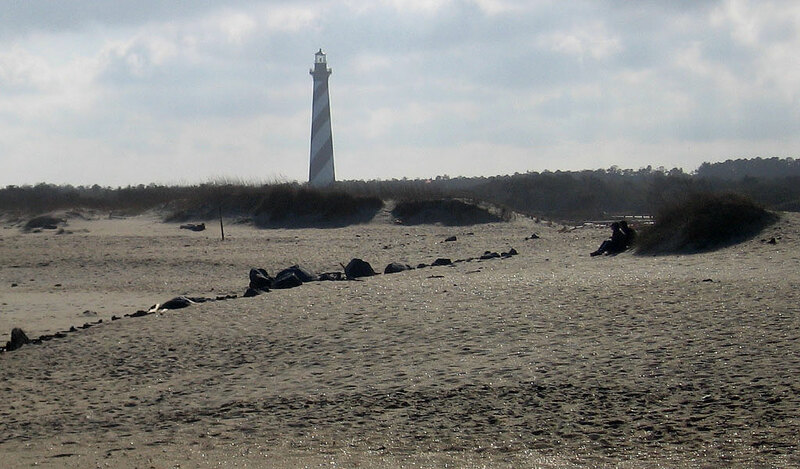 Bill's OBX Beach Life: Meaty and "Green" at the Lighthouse! I missed a number of cold weather windsurfing days this winter to keep my leave bank up as warm springtime and summer approach! There have been some "missed its;" though most were part of cold, cloudy, and even rainy weather this month. Definitely, not the late spring-like weather we had all during the winter of 2008. 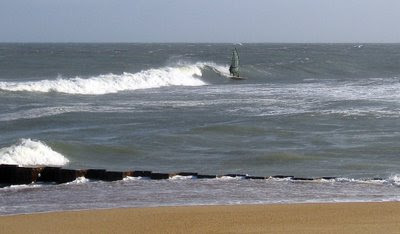 Given, my relative "greenness" this winter, a wave sesh at the Lighthouse was an excellent opportunity to test both stamina as well as skill! Conditions at the Lighthouse were quite meaty with set waves ranging well overhead. Air temps hovered around 50 degrees with water in the low to mid 40s. Full neoprene, including cap, gloves, and booties were required. Powered 5.0m N wind provided the juice, though there were some lulls out there. 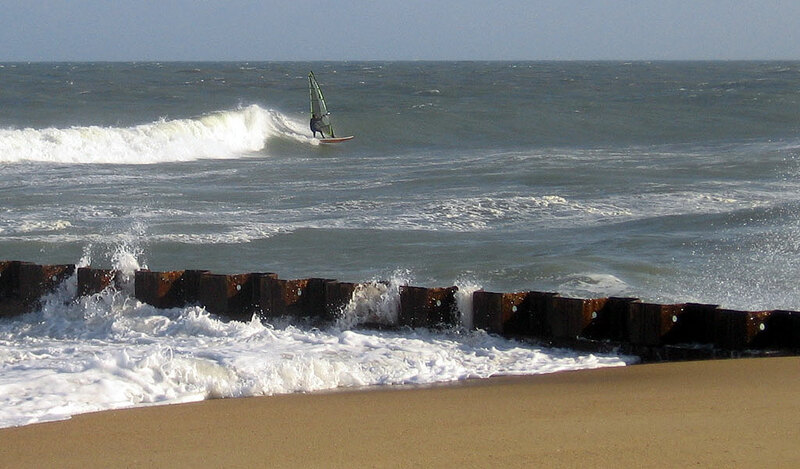 Andy and I were out along with a few surfers and one of the Real kite crew. 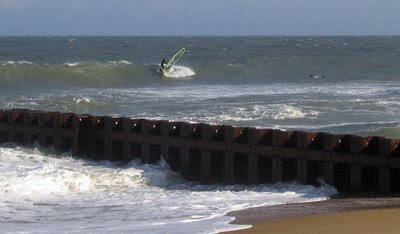 The north wind provided a clean lineup, and an excellent opportunity for great wave rides; however, the only drawback was taking it too far inside and down into the current zone. It was a current conveyor out there, and most rides required a return to the beach and a hike back up to the groin for relaunch. Getting out was not too bad, however if you were slogging into a set line, it was challenging. I was denied three times, and Andy once, though he paid a little higher price with a broken mast, while I was simply physically spent by the rinse cycles and beach gear hikes as the strong current swept south. All in all, it was excellent Lighthouse conditions; however, my "greenness" kept my game a little below par. 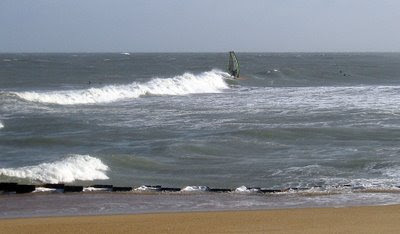 Hopefully April will bring on the wind and warmth, to at least shed perhaps the cap, gloves, and booties, along with the winter windsurfing "greenness!" Good sailing with ya the other day, Bill! Cheers, to more good days as Spring rolls on through! !